Analog aficionado Jack White has a new project designed to get your kids interested in vinyl early on. 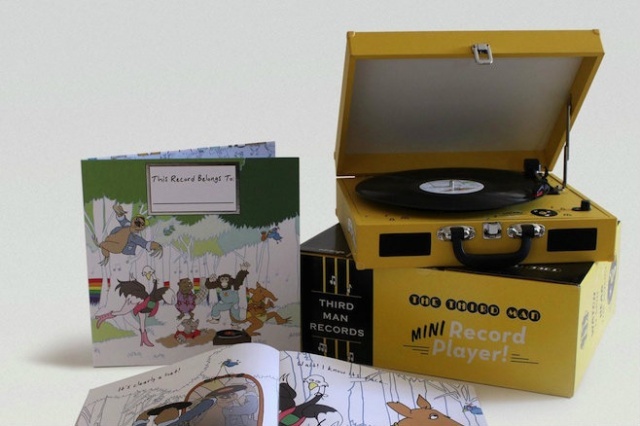 A joint effort between White’s label, Third Man Records, and Light in the Attic records will release a new kids’ compilation album, complete with a portable children’s turntable featuring built-in speakers that a lot of us grew up rocking — apart from the addition of a USB port, that is. Entitled This Record Belongs To ________, the album features kid-friendly tracks from Nina Simone, Jerry Garcia, Harry Nilsson, Van Dyke Parks, Donovan, Carole King, Kermit the Frog and others. “What if your favorite children’s book were not only a timeless story but came with a soundtrack of tunes that kids and grown-ups alike would love?” reads the press release. The record includes an “upbeat side” to help your kids jam out, and a mellow side for when they’re ready (or you’re ready for them) to crash. The compilation was inspired by the Little Golden Books Series and Sesame Street’s In Harmony albums, according to Third Man. Also featured is an original, full-color storybook illustrated by Jess Rotter, which tells the tale of “five forest pals” who discover a mysterious round object which turns out to be a vinyl record. The accompanying turntable is a portable, three-speed, record player in the classic suitcase style from Jensen, with an automatic tone arm to boot. The includes USB port allows users to convert vinyl records to the digital realm, too. The bundle, which will be available on November 6 via the Third Man store online and at Third Man Records’ brick-and-mortar store in Nashville, TN, costs $95. The label came around, though, and will release white, grey and black Ts featuring the Third Man logo. The pocket T-shirts will be available starting September 12 online and at Third Man Records in Nashville, TN.